Bootie SF: Boy Bands vs. Girl Groups! San Francisco Bootie SF: Boy Bands vs. Girl Groups! 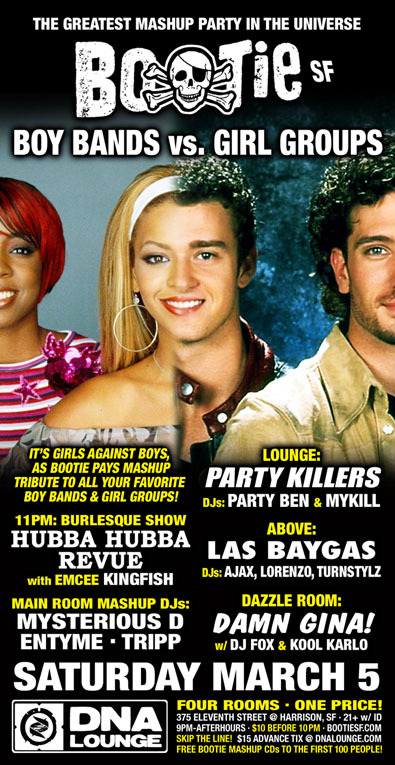 It’s girls against boys, as Bootie pays tribute to the best boy bands and girls groups in the world by mixing and mashing them up with anybody and everybody! Backstreet Boys or Spice Girls? N’Sync or TLC? Duran Duran or the Go-Go’s? Jackson 5 or the Supremes? No group from any decade is safe from the Bootie mashup treatment! Main Room mashup DJs Mysterious D, Entyme, and Tripp spin the best of the boys and girls into one non-stop mashup dancing frenzy all night long, while Hubba Hubba Revue takes to the Main Stage at 11 PM to titillate and tease you with the Bay Area’s best burlesque, performing to your favorite boy band and girl group songs! Upstairs in the Lounge, it’s Party Killers, featuring Party Ben and Mykill, as they throw down house remixes and more to make you dance. In Above, it’s Las Baygas, as DJs Ajax, Lorenzo, and Turnstylz spin Vegas-style club bangers to get you on the dance floor. And in the Dazzle Room, it’s Damn Gina, with DJ Fox and Kool Karlo spinning super fun dance music to get your groove on. All this, plus drag hosts Holy McGrail and Suppositori Spelling and FREE Bootie mashup CDs to the first 100 people!